OCTOBER 19, 2018 — On October 10 and 11, OR&R staff participated in the Crowley Alaska Tankers "Shippers" Exercise in Valdez, Alaska. 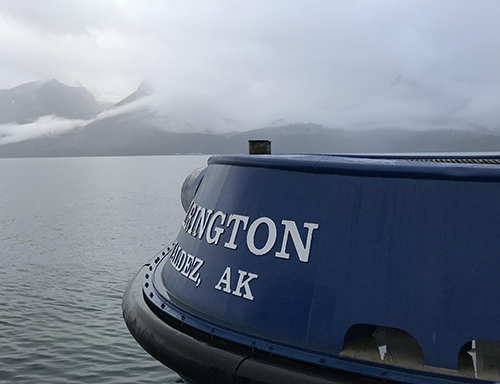 Representatives from NOAA's National Marine Fisheries Service, U.S. Coast Guard (USCG), State of Alaska as well as various federal, state and industry entities also participated. The exercise scenario involved a tanker collision and release of 140,000 barrels of crude oil in Prince William Sound. Endangered Species Act Section 7 consultation, formulation of a Shoreline Cleanup and Assessment Technique plan, and evaluation of Resources at Risk and Geographic Response Strategies were among the primary goals of OR&R's involvement in the exercise. 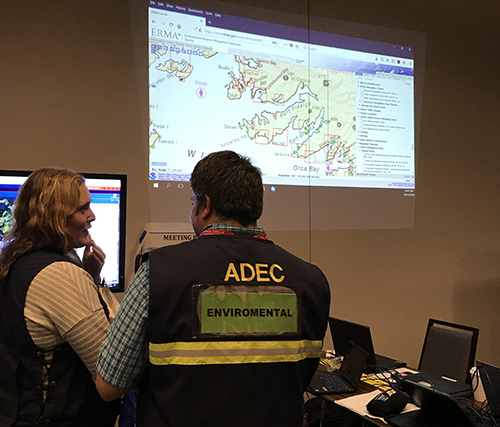 OR&R's Spatial Data Branch presented on the Arctic Environmental Response Management Application (ERMA®), data sharing and the newly signed USCG/NOAA ERMA Inter-agency Agreement. A Data Sharing Plan was implemented and signed by USCG, State of Alaska and Crowley Alaska Tankers representatives allowing operational data to be shared between Crowley Alaska Tankers Common Operational Picture and ERMA. For more information please contact Catherine.Berg@noaa.gov or Zachary.Winters-Staszak@noaa.gov. Go back to the OR&R Weekly Report. ERMA map projected on the wall during the exercise. Image credit: NOAA.